Ferrero, the Italian chocolate maker, is to advertise its Kinder Chocolate product on television for the first time, in an effort to target mums with its “Invented for kids” strapline. Ferrero has previously marketed its Kinder Surprise brand, a hollow egg with a gift inside, on television in the UK. But it is now looking to increase the market share of Kinder Chocolate, which is sold in milk-filled bars. The move comes as Ferrero aims to up the presence of a number of brands in the UK with marketing campaigns also supporting Ferrero Rocher and the Ferrero Collection. The TV ad for Kinder Chocolate will launch on Monday (16 April), complemented by activity in print. It has been created by Krow, with the animation in the ad designed by artist and illustrator Oliver Jeffers. Executives at Ferrero believe that with TV support, Kinder Chocolate could be a big hit in the UK, particularly as it is sold in bite-sized pieces to encourage responsible and moderate consumption. However, Ferrero Chocolate is up against established brands such as Cadbury. 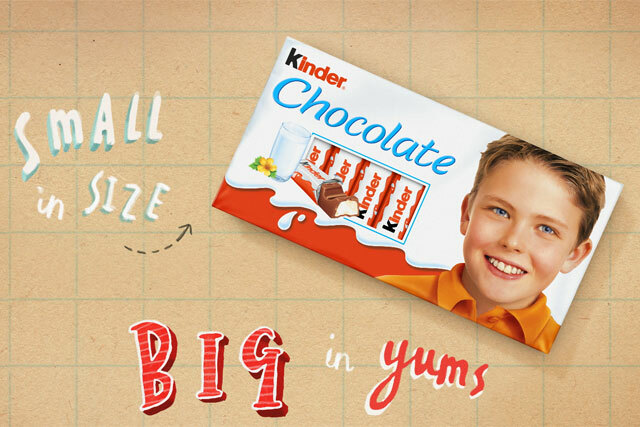 Mauro De Felip, marketing director for Ferrero UK and Ireland, said: "We're excited to be launching our very first stand-alone campaign for the Kinder Chocolate brand in the UK. "Ferrero have committed significant investment to the Kinder Chocolate brand in a bid to pursue our aggressive ambition for the brand in the UK over the next five years."